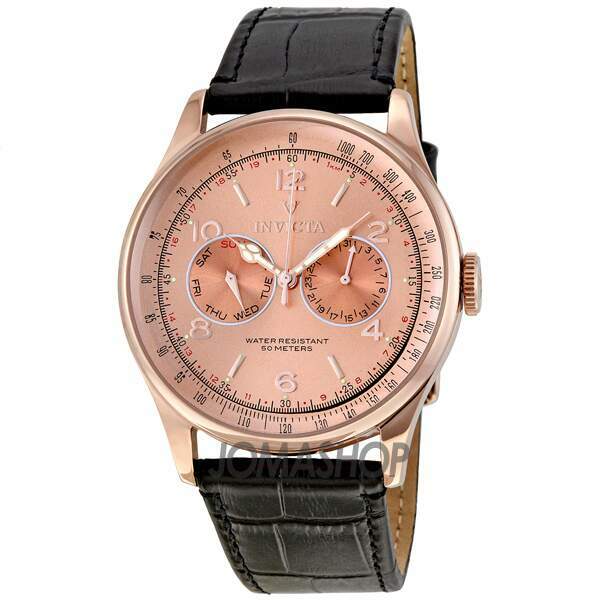 Rose gold-tone stainless steel case with a black leather bracelet. Fixed rose gold-tone bezel. 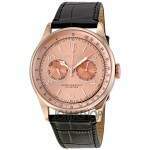 Rose gold dial with gold-tone hands and alternating stick and Arabic numeral hour markers. Minute markers around the outer rim. Two sub-dials displaying: date and the day of the week. Swiss quartz movement. Scratch resistant flame fusion crystal. Solid case back. Case diameter: 44 mm. Case thickness: 12 mm. Tang clasp. Water resistant at 50 meters / 165 feet. Functions: date, day, hour, minut, second. Invicta Mens Vintage Collection Watch 6752.